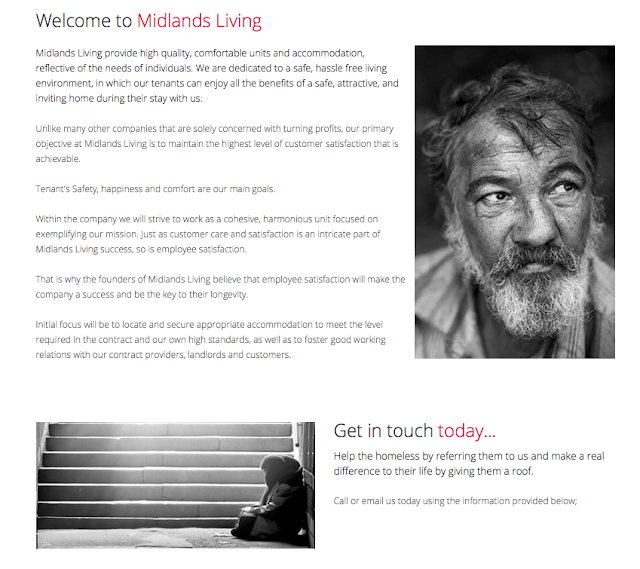 This week's website of the week goes to Midlands Living, whose mission is to provide high quality, comfortable units and accommodation for vulnerable and homeless individuals. Midlands Living were looking for a website that gave a warm and welcoming feel, as well as being clear and easy to use. Project Manager Andy started off by creating a basic text based logo design. Creating something that is eye-catching as well as an indicator as to what the website is about. The client is using a red colour scheme, which works well with the chosen imagery, and this in turn gives it a really professional feel. The website also uses the Google Font "Open Sans" meaning that it's really slick and in keeping with the logo branding. It's a font that doesn't portray too much "seriousness" like Georgia or Times New Roman, but isn't too "funky" like Century Gothic. It gives it a good balance of friendliness but remains professional at the same time. The website uses full width panels, which makes it feel very open plan and easy to follow. The internal pages are simplified to make sure the information displayed is easy to read and clear. The style and consistency on each page is key to the design of the site. Each page has a stock image picked suitably for the nature or topic of the page. You can find some great stock imagery, and we have an account with Shutterstock meaning we can access millions of images for you to use on your site, if you wanted. The website has a page dedicated to latest vacancies, which you might want to do to advertise positions you have available. You could go one step further and have a form created where people can upload their CV to send to you. The website also features an easy to use Contact Form meaning anyone that wants to register their interest or get in touch, can do so. The client was pleased with the end result, saying that they loved the design and price at Toolkit Websites.